In today’s world, your business most have a website if it wants to compete with the world that is increasingly operating online. But, this does not mean just having a website that looks like it was made in 1999 will suffice. If your business website looks like a Geocities website than it is safe to say that it is being bypassed by your intended customers. This is bad for you because your website is what helps your business generate online sales. Since your website is your sales portal, you need to ensure that it is operating at its maximum level to create more customers for your business. Unfortunately, a lot of websites are not being developed to satisfy this mission. For one reason or another, your website might be doing something wrong that is diminishing its ability to acquire new customers. 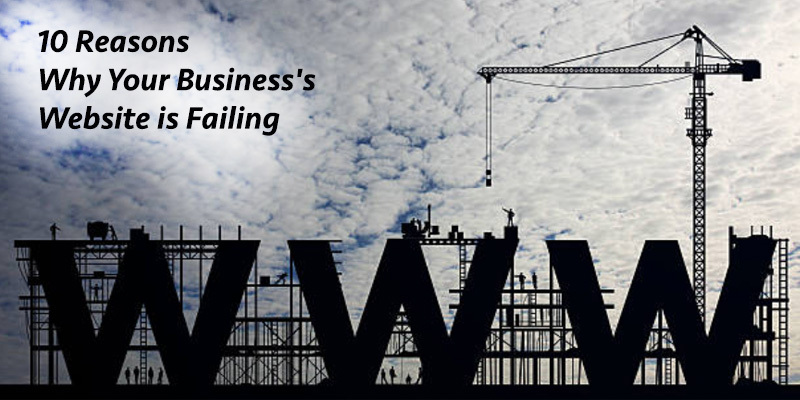 This means that your website is wasted online real estate, rather than being a valuable asset. If your website is not converting visitors into customers, you need to know the exact problem that is occurring. We have put together a list of the ten common reasons why websites fail at turning visitors into customers. Read the list and see if your website is making one or more of the mistakes that are listed. Mobile devices and tablets are now surpassing the usage of computers. These devices are where customers are doing their online searches for businesses they would like to purchase from. The reason being is because customers are now making their decisions on the go — they want to know what is around them when they are out and about. This means that people will continue to make their purchasing decisions from their smartphones and tablets. Therefore, your website needs to be optimized to handle mobile users. So, if your website is not mobile friendly, then you are dealing with a huge problem that will hurt your website’s ability to convert. This will cause your business to be penalized by Google negatively affect your ability to convert visitors into customers and will cause visitors to have a bad experience. In order to have a mobile friendly website, it needs to have a responsive design, Call to actions and a simple layout which is easy to navigate. You would want to test your website yourself to ensure that it properly functions on mobile devices. Do not make the mistake of trying to speak in technical terms in order to demonstrate the amount of expertise that you have. Industry jargon should be reserved for other industry experts and not the people who you are trying be your customers. They do not care about how well you can communicate in the technical language. They need you to clearly communicate the product or services. If your website has too much technical language, you need to immediately overhaul this problem. Focus on clearly talking about the problems that your business solves so that customers can understand the value that your business provides. The ability to do this cannot occur if customers are confused trying to understand what your technical language is saying. Just keep your language simple if you want to effectively communicate with potential customers. Customers are looking for solutions to their problems and your content is supposed to lead them to these solutions. Therefore, your website needs to provide valuable content that your potential customers find beneficial. You do this by creating a blog that focuses on demonstrating your knowledge through great content. This does not mean that you overly promote your business through your content. Doing so is spamming rather than providing value to the customer. If your content is written in great detail and leads towards solutions being produced, it will convert readers into customers without having to be too promotional. A great blog also helps improve your SEO rankings, which help your website get found by customers looking for a business to solve their particular problems. If your blog shows up in the top of search engine results, you have a better chance of converting these people into customers. Business address: If people are not able to find your business then you are missing out on the opportunity of potential customers visiting your business. Business contact information: It makes absolutely no sense to have great content and products or services people want to buy but no way for them to contact you. Social media information: Customers like to be engaged with the businesses they purchase from on social media. If your business cannot be found on social media, this is a red flag. Your open business hours: Customers want to know the times you are open for business so that they do not call or drive to your location when you are not open. Pricing: Most customers want to know how much your products or services cost in order to finalize their purchase decision. Your “about us” page: Potential customers want to know what your business is about to determine if they are a good fit to become a customer of your business. Without having this information listed, your business does not appear legitimate. After all, which serious business will not include all of this essential information on their website? We live in times where a website needs to load in under 5 seconds. Anything over that and people will abandon your website because their attention cannot wait beyond that timeframe. If people are leaving your website due to an issue such as this one, be rest assured that they will not be coming back either. Test the speed of your website and then find advice on how to improve its speed if you find that the load time is too slow. Just because people visit your website and like the information you provide does not mean that they will automatically become customers of your business. You still have a little more work to do before that occurs. This is why you need to have a call-to-action on your website that directs visitors to take the next step towards becoming a potential customer of your business. You want to navigate visitors towards being within your sales funnel so that you can nurture them towards customer status. This does not happen without having a call-to-action in right place. An outdated website screams of a business that either is struggling financially or does not understand the importance of their online appearance. In either case, people will bypass your website because they perceive that your website’s appearance represents the type of service you offer — below quality. Your website does not have to be insanely expensive but it does need to be invested into. Makes sure that your website fits today’s standards of websites. A simple layout with a white background will do. You can enhance your website by adding quality images and videos that help to keep visitors on your website longer. The objective of your website is to provide information that converts visitors into customers and to sell your products or services. This objective cannot be achieved if your website is cluttered with distractions that turn visitors away from your website. Music and videos that play once people enter your website are annoying and they slow your website down. No one wants to constantly pause these items when they are trying to browse through your information. Bright colors and super fancy text also make it hard for people to read over your content. Keep things simple. You can have flash without being over the top. If people want to make a purchase but cannot because your payment platform is not working you have a huge problem. That is a lot of sales that you are possibly missing out on that may not return due to the mishap. This is why you want to frequently check your payment platforms. You do not want to go days or weeks without knowing that people cannot make a purchase on your website. Sending visitors to your homepage does not achieve the objective that your website was designed for — to convert visitors into customers. You need to send visitors to the exact pages on your website that are designed to convert them into customers. This is your blog and product/ service page. Direct people to these pages so that they can start being processed through your sales funnel. If your business’s website has any of these problems, immediately make changes so that your business website can improve its ability to convert visitors into customers. You do not want to have a website that is wasted online real estate rather than a cash generating asset. Get your web design upgraded today! Rikvin is a one-stop centre for all services that will help you succeed in your business.